Re-thrash graduates of 2008: Hatchet. Hatchet as of 2018: still got the degree, haven’t studied much more. Friends may assume they are living back at their parents’ houses again. But that’s not really for lack of trying, because Hatchet have had a string of mildly successful jobs such as 2013’s Dawn of the End and 2015’s Fear Beyond Lunacy that came after a few years spent travelling on the proceeds of 2008’s Awaiting Evil. Added to that, they’ve been – if not around the world – to enough countries to have gained a full taste of life. And yet here they are in their parents basements again. (Okay, so maybe Combat Records isn’t exactly a basement.) Hatchet’s problem? The job market is just so saturated with good candidates, some of them with years of previous experience from right back when the industry began, some of them with higher qualifications that make others look a bit silly; others still with that creative spark that turns them into successes that much faster. As for Hatchet, they are simply hard workers, which is why their parents are allowing them free room and board, as well as why they aren’t living a jet-setting lifestyle or speaking to rabid press night and day. They’re pretty good, are Hatchet, but not something special. 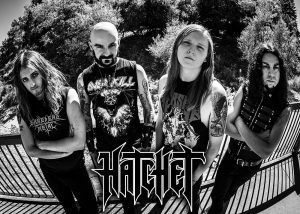 Regarding Hatchet’s skills in modern times, they might have been honed a little more and their songwriting made tighter between Fear Beyond Lunacy and Dying to Exist, but that doesn’t mean that a great deal has been done differently. The modern production still allows Ben Smith’s drumming to knock clinically against the eardrums of the listener, while lithe crunchy guitars do the groundwork for most songs, focusing on speed and riffs, which – after all – is the priority for most thrash metal. Expanding their range slightly to include the death metal styles flavouring “Desire for Oppression” and some exuberant classic metal melodies, the Bay Area four-piece have simply taken another small step on a journey familiar to fans of Warbringer, Havok, and Bonded by Blood (if one discounts the recent stagnancy of the latter). Therefore, despite the slight thinning of the field among the re-thrash graduates, Dying to Exist finds itself amid a large number of similar-sounding releases, wherein the tendency to slightly dilute the original ‘80s flavour with other influences slowly gathers strength. The word that the previous paragraph was circling for most of its length was “bland”, which is a criticism that could be thrown around by those who feel that this style has run its course. The over-excited vocals of Julz Ramos constitute both a blessing and a curse on this theme, since his yelping tone adds an urgency to several songs yet doesn’t exactly imbue the music with the level of finesse that could take the band to the next level. Vocal quality aside, the 10 full songs (plus two introductions) on the album attempt to bring something different to a basic formula, though copious surprises fail to materialize except when “Warsaw” jauntily drops a dramatic melodic section into a number otherwise tough and tense. A few songs head away from typical structures too, yet the shorter average length (only slightly above four minutes) means there is less chance to explore too many alternate routes. Familiar riffs of the kind found opening “Back into Dust” take their toll towards the end of the listen, as a cover of Vio-lence’s “World in a World” offers an unsurprising close to proceedings. Without sounding down on Hatchet’s latest effort, it isn’t terribly surprising that they have been rather ignored in recent years, as this kind of re-playing of past efforts can’t whip up enough excitement for thrash fans to invest much time. Don’t mistake Dying to Exist: this is an entirely credible take on the modern thrash metal sound and offers some well-executed diversions from convention on “Warsaw”, “Desire for Oppression”, and the alternately melodic and technical “Final Sanctuary”, but there is no special reason to pick it out from the mass of re-thrash alumni. Hell, even though Havok dropped a clanger with their latest political faux pas, at least it had people interested – Hatchet are more likely to have headbangers nodding politely and playing Bonded by Blood again. That’s not a bad reason to exist, but it’s also not a viable niche to forge a long-term career. Quite simply, these guys are likeable but probably doomed to mediocrity. 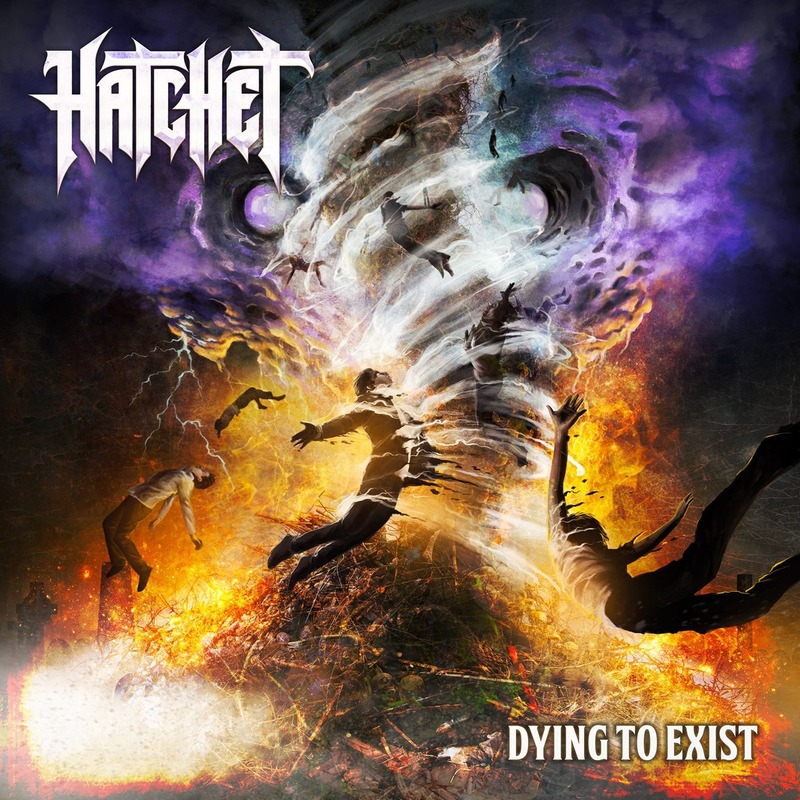 This entry was posted in Once and Future Thrash, Thrash Metal and tagged 2018, Bonded By Blood, dying to exist, graduate, Hatchet, Havok, Re-thrash, Thrash, thrash revival, Warbringer.